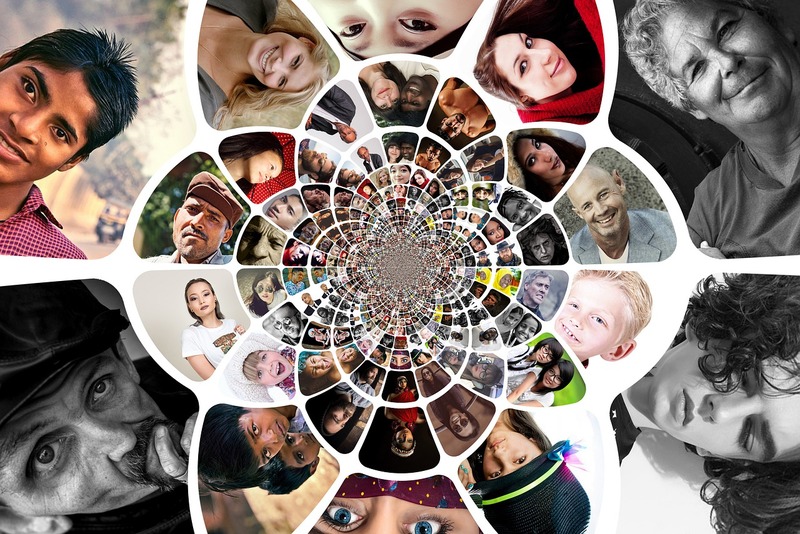 A person is considered a native of a participating country if they were born in that country. An immigrant may also be “charged” to their spouse’s country of birth, or the country of birth of their parents, if the applicant was born in a different country of birth or lives in a different country of residence. Allocation of the 50,000 available diversity immigrant visas is divided among 6 geographic regions including Africa, Asia, Europe, North America, Oceania, and South America, Central America, and the Caribbean are grouped as one geographic region. 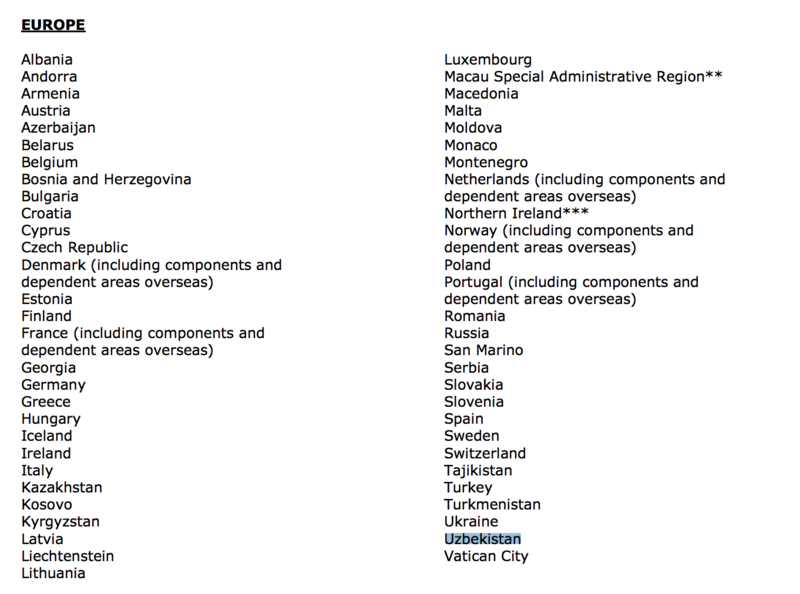 Uzbekistan is, and as far as our research is concerned, has been a country participating in the Diversity Visa Program since as far back as 2007, according to the U.S. Department of State archives. Therefore, Saipov could have entered on a diversity immigrant visa. However, it is puzzling why no evidence has been released by the Department of Homeland Security to corroborate this information, or at least provide more details regarding his entrance. While speaking to reporters, the President said that Saipov had brought relatives with him to the United States and that he was the “primary point of contact” for 23 people that came or potentially came in with him to the United States. 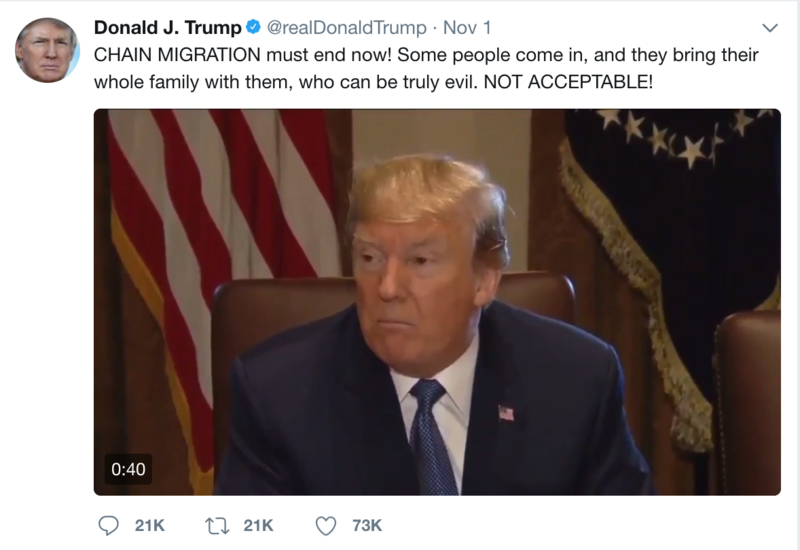 The President made this statement to justify his stance on ending “chain migration” to the United States. This statement by the President seems far-fetched. What exactly does the President mean when he says Saipov was the “primary point of contact” for 23 people? Does the President mean that Saipov signed 23 affidavits of support to assist relatives financially in immigrating to the United States or had he himself petitioned for 23 other people to obtain immigrant visas? It is highly unlikely that Saipov, a green card holder, and not a US Citizen, would petition 23 other people. Even if that were the case, it is well known that Congress has capped the number of immigrant visas available to qualifying relatives of green card holders. Due to these congressionally mandated caps, relatives of green card holders who qualify for an immigration benefit must wait enormous backlogs for an immigrant visa to become available to them. It is not uncommon for relatives to wait decades before an immigrant visa becomes available to them, in accordance with visa projections found in the Visa Bulletin. If a green card holder wanted to petition for a relative to come to the United States, the relative would first have to have a qualifying relationship with the green card holder (spouse, child, unmarried son or daughter), then the green card holder would first have to file the I-130 petition, and once the petition is approved, the beneficiary would need to wait until an immigrant visa would become available to them. Even spouses and children of permanent residents must wait several years before an immigrant visa becomes available to them, while more distant relatives fare worse. Thus, the possibility of Saipov having petitioned for 23 other people as a green card holder is simply impossible given our current immigration laws. 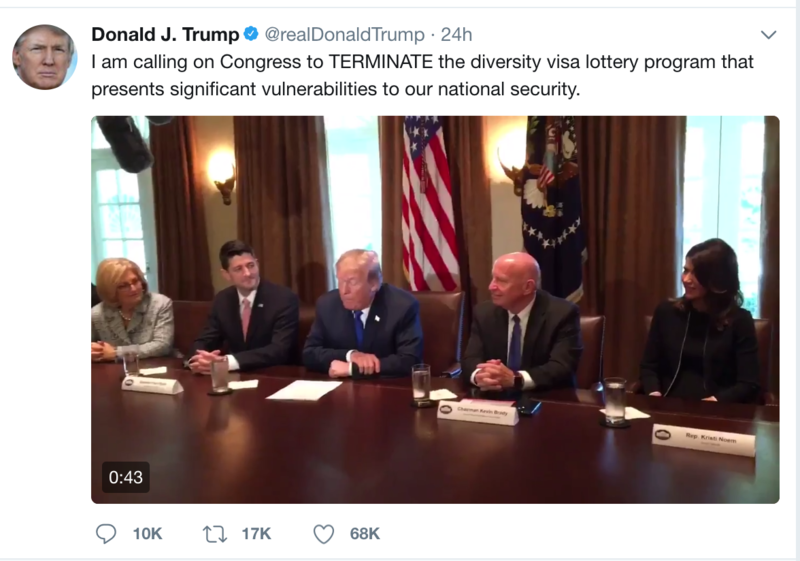 Having already discussed the impossibility of a green card holder petitioning for 24, 25, or 26 people, we move to the President’s assertion that the diversity visa program is “very unsafe” and that “the people put in that lottery are not the country’s finest.” It is deeply troubling that the President would make such remarks without having any facts to support this statement. Over the years, our office has helped hundreds of diversity immigrants apply for permanent residence through the program. Many of these individuals were business owners in their own countries, physicians, engineers, and the like. In addition, to qualify for a visa, diversity immigrants must attend a rigorous in-person interview whereby an immigration officer will assess the immigrant’s admissibility to the United States, and their qualifications. Applicants are also vetted for any criminal history, using fingerprints obtained by USCIS during the biometrics appointment. During the interview, the officer has an opportunity to probe the applicant regarding their criminal history. If the beneficiary has been arrested, the beneficiary is required to provide copies of all arrest records. The beneficiary must also present a medical examination, and supporting documents to prove that they possess the minimum academic or qualifying work experience to qualify for the diversity immigrant visa. There is simply no evidence to suggest that current safeguards for the program are inadequate. Moreover, Saipov was radicalized after he entered the United States, not before. An immigration officer could not predict his future actions. Lastly, in regard to chain migration the President said, “We will be asking Congress to start working on that immediately. There are bills already about ending chain migration. We have a lot of good bills in there. We are being stopped by Democrats, because they are obstructionists, and honestly, they don’t want to do what is right for our country. . . We are going to get rid of this lottery program as soon as possible. He came in through the Diversity program as you know and we are going to stop that. 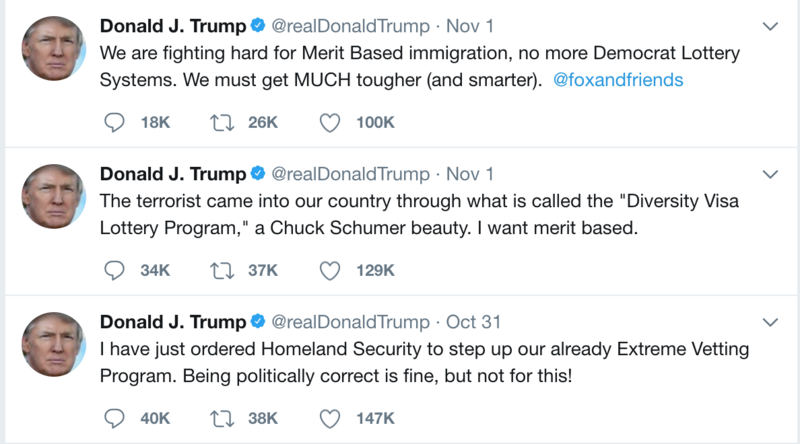 We are going to as quickly as possible get rid of chain migration and go to a merit based system.” The President has said that he will call upon Congress to implement immigration reform that focuses on admitting only highly skilled foreign nationals based on a point system that takes into account the individual’s education, specialized skill sets, employment experience, language proficiency, and age, and eliminates the family-based immigration system. The problem? Our employment-based immigration system already awards visas based on merit. For example, the H-1B work visa is awarded only to highly skilled individuals who possess a Bachelor’s Degree in a specialized field or its equivalent. Take another example: The O-1 visa is awarded to foreign nationals of extraordinary ability and like the H-1B creates a path to permanent residency. The merit-based system Trump envisions is already in place, however highly skilled individuals holding these visas must go through a slow and outdated process to obtain a green card. This area of the law certainly needs improvement. As it relates to “chain migration,” as we have already mentioned, immigrant visas for extended family members of US Citizens and green card holders, are limited and subject to backlogs as imposed by numerical limitations. Only immediate relatives of US Citizens receive permanent residency on an immediate basis meaning that their visas are not subject to numerical limitations. We fear that the President’s remarks are not well-founded in the law, and are representative of a President who does not understand the immigration system currently in place, and who frankly does not care to understand how it truly works. The President is simply trying to appease his conservative base by acceding to their demands.